The American Pit Bull Terrier (APBT) is a medium-sized, solidly built, short haired dog whose early ancestors came from England and Ireland. During the 19th century, England, Ireland, and Scotland began to experiment with crosses between bulldogs and terriers, looking for a dog that combined the gameness of the terrier with the strength and athleticism of the bulldog. The dog was bred first to bait bulls and bears. When baiting bulls was deemed inhumane, ratting (a sport where a number of rats were placed in a pit for a specified time with the dog) and dog fighting became more popular. The APBT was used in both sports, and its prevalence in being put in pits with rats led to "pit" being added to its name. With time, the dogs became more commonly used as house pets due to their friendliness towards people. In America, farmers and ranchers used their APBTs for protection, as catch dogs for semi-wild cattle and hogs, to hunt, and to drive livestock. The dog was used during World War I and World War II as a way of delivering messages on the battlefield. The name "Staffordshire Terrier" was adopted by some owners as a way of distancing the breed from a name with a stigma, and was recognized by the American Kennel Club in 1936. Later, the word "American" was added to reduce confusion with its smaller British cousin, the Staffordshire Bull Terrier. Once an extremely popular family dog in the United States (for example, Pete the Pup in The Little Rascals movies and Tige in Buster Brown was an APBT), the American Pit Bull Terrier's popularity began to decline in the United States following World War II in favor of other breeds. The American Pit Bull is medium sized. It has a short coat and smooth, well-defined muscle structure. Its eyes are round to almond shaped, and its ears are small to medium in length and can be natural or cropped. The tail is thick and tapers to a point. The coat is glossy, smooth, short, and slightly stiff and can be any color except merle. The breed ranges from a height of about 14 to 24 in (36 to 61 cm) at shoulders, and weighs between 30 and 60 lb (14 and 27 kg). The APBT is a breed that is loyal to friends and family, and is generally friendly towards strangers. Many have strong instincts to chase and seize cats and other fleeing creatures, including deer and livestock (prey drive). As with any dog breed, proper training and socialization at an early age is a must. According to the UKC, "aggressive behavior toward humans is uncharacteristic of the breed and highly undesirable." The American Temperament Testing Society shows a pass percentage of 86% for American Pit Bull Terriers as opposed to the Golden Retriever with a temperament of 87.3%. American Pit Bull Terriers generally have a lot of energy and benefit from exercise and stimulation to channel their energy properly and avoid becoming frustrated, bored, or destructive. The average life expectancy of an American Pit Bull Terrier is about twelve to fourteen years making them one of the longer living large breeds. The breed tends to have a higher than average incidence of hip dysplasia. They may also suffer from patella problems, thyroid dysfunction and congenital heart defects. 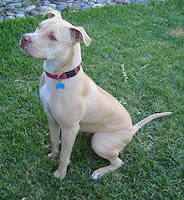 American Pit Bull Terriers with dilute coat colors have a higher occurrence of skin allergies. Being intelligent, athletic dogs, American Pit Bull Terriers excel in many dog sports, including weight pulling, dog agility, flyball, lure coursing, and advanced obedience competition. Some APBTs have been known to do well in schutzhund as well. Out of the 25 dogs who have earned UKC "superdog" status (by gaining championship titles in conformation, obedience, agility, and weightpull), fourteen have been American Pit Bull Terriers. The American Pit Bull Terrier is a working dog, and is suitable for a wide range of working disciplines due to their intelligence, high energy, and endurance. In the United States they have been used as search and rescue dogs, police dogs performing narcotics and explosives detection, Border Patrol dogs, hearing dogs to provide services to the deaf, as well as general service dogs. Twelve countries in Europe, Australia, Canada, Ecuador, New Zealand, Puerto Rico, Singapore, and Venezuela have enacted some form of breed-specific legislation on pit bull-type dogs, including American Pit Bull Terriers, ranging from outright bans to restrictions and conditions on ownership. The state of New South Wales in Australia places restrictions on the breed, including mandatory desexing, in order to ensure the eventual extinction of the breed in that state. Many states, counties, and cities in the United States have outright banned ownership of the American Pit Bull Terrier. Consequently, some American Pit Bull Terrier breeders have begun claiming that their animals are actually American Staffordshire Terrier, a breed which is similar in appearance to the American Pit Bull Terrier. This name came into use in Britain in order to get around laws banning American Pit Bull Terriers, but the RSPCA does not recognize this breed as legitimate and separate from its Pit Bull Terrier counterpart. American Staffordshire Terriers are themselves on a list of four breeds that are banned in the UK. and are destroyed whenever a dog is confirmed to be one of the banned breeds.